The Lumikko OptiTemp X3 is third generation temperature registration device that combines the latest data transfer and GPS tracking possibilities, integrated printing capabilities, new design and conformity with the EN12830 directive. 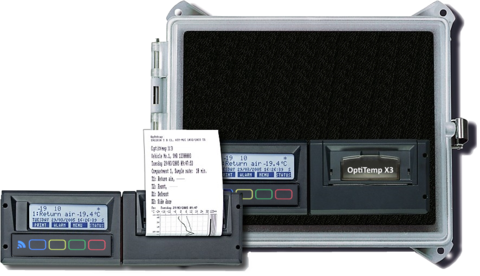 Lumikko OptiTemp temperature registration devices are designed for the registration, monitoring and alarm indication of the temperature in food and animal transporta- tion, as well as in refrigeration and freezer spaces. Loading, unloading, idle and driving times can be reported using door switches or by creating points of interest (POI) in terminal areas. This makes vehicle route planning easier and improves efficiency. The web service is very easy to activate, without any additional software or settings needing to be installed on the customer’s computer. The service is used with a Web browser. The positioning service uses Google Maps. Vehicle-specific identification data defined by the customer is created in the system. This data serves to identify each vehicle or cargo space. The visibility of single device data can be limited using personal user IDs.